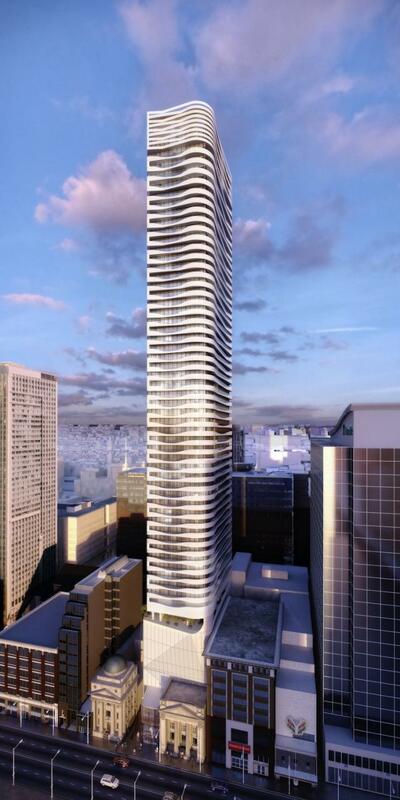 MOD Developments Inc. is developing the Massey Tower Condos located at 197 Yonge St in the celebrated Theatre Block, in Toronto's downtown core. The 20,000 square foot site contains the historically designated Canadian Bank of Commerce Building, designed by Darling & Pearson Architects in 1905, and vacant since 1987. MOD is going to completely restore the four storey portion of the bank, and erect a 60 storey (669 units) mixed-used development behind the historic landmark. MOD will further contribute to the enhancement of the neighbourhood by donating a portion of their site fronting on Victoria Street to Massey Hall. In honour of the Massey family, MOD will appropriately name the new building Massey Tower. Designed by the renowned architectural firm Hariri Pontarini Architects, winners of the coveted Governor General’s Medal for architectural excellence, the soaring Massey Tower will feature retail, residential and non-residential uses. The location is ideal for a residential development, with the Queen Street subway station steps away, world class shopping at the Eaton Centre across the street and the Financial District and Ryerson University nearby. Available suites range in size 378 sq ft to 800 sq ft, starting at $331,250. Parking is $69,000 extra (available for 2 bedroom suites and larger). Occupancy is scheduled for November 2018.